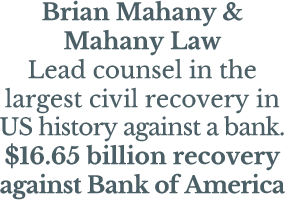 Brian Mahany and Chris Katers, lender liability lawyers who sue banks and other lenders on behalf of cheated businesses and individuals, are available for media comment or to speak on the topics listed below. This can include bank misconduct or misrepresentation in the loan application or origination process, sham delays, prohibited discrimination, appraisal fraud, insurance issues, or other breaches of a loan commitment. When a bank for no legitimate reason suddenly demands a personal guarantee or pledge of additional assets with a ridiculously short time frame, a borrower is often compelled to comply in order to obtain a loan renewal. Fine print is ubiquitous in loan documents and unscrupulous lenders will use any opportunity to claim a technical default in order to take over a business or property or force a borrower into a high fee or increased interest rate situation. Bank and lender misconduct in the foreclosure process has been rampant and is still the subject of extensive litigation with much more coming in the CMBS (Commercial Mortgage Back Securities) arena. Mortgage servicers often conspire with lenders to generate massive fees or to illegitimately take over property. Lenders are prohibited from contacting a debtor’s customers, vendors, contractors and such or interfering with management absent a legitimate concern over their security. Unscrupulous lenders often wrongfully interfere with a company’s business to generate illegitimate fees or take over property.